Diminishing Marginal Returns and Societal Collapse – How close is the USA to the tipping point? Yesterday I came across this chart . I am assuming it is using the correct data but I haven’t checked. If the data and the trend line are correct we should be very worried – very very worried. Why? This chart is measuring the economic return from new investment in the USA. It is suggesting that there is a trend of diminishing marginal returns. 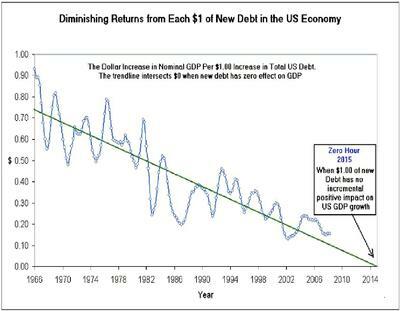 The latest data suggests that for every dollar of new debt there is only 20 cents of economic growth and this could hit zero by 2014. A resurgence of the oil price could speed this process up. And when the incrimental debt to incrimental debt ration dips below zero new investment will start to shrink the economy rather than expand it. Why we should be concerned with this is that Joseph Tainter, author of The Collapse of Complex Societies, discovered that the common cause behind the collapse of 24 societies that he studied was “diminishing marginal returns”. 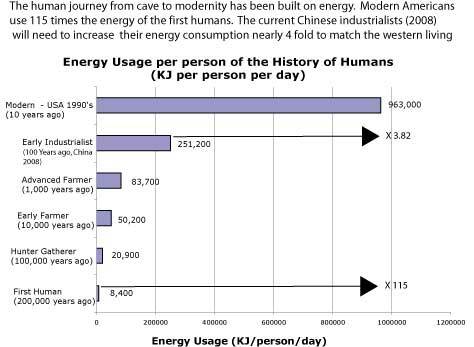 The story of human progress is a story of our increased capacity to harness and use energy – our modern western lifestyle requires nearly four times the amount of energy per person to maintain than it did 100 years ago. This has only been possible because of cheap oil and this will not last forever. Moreover, the infrastructure and economy of the USA has been built on the basis of cheap oil and cheap transport. This has left the US economy with very poor resilience. Tainter’s study showed that as societies become more complex they create problems that they try to solve by adding greater layers of bureaucracy. This complexity costs energy. All around the world we see governments growing larger and consuming a greater proportion of GDP. Even the Republican party – the party of small government – has increased quickly under George Bush. And the latest round of bailouts are a further example of the added costs of government costing more money to try to solve problems brought about by the complexity of financial derivatives. Tainter is not the only historian to suggest diminishing marginal returns lead to societal collapse. Thomas Homer-Dixon has suggested that societal collapse occurs when the Energy return on Energy Invested, or EROEI, approaches 1:1. When EROEI falls below 1:1 it takes more than one unit of energy to harvest one unit of energy and collapse occurs – in today’s world energy and money are equivalents. By his definition we fit the Runaway Train model as a society that only functions when growth is present. We are a suicide machine and capitalism is a runaway train. Look at how China is responding to a fall in economic growth from 11.9% to a projected 8% – it has committed over $600B to re-stimulate demand. Even at a growth rate of 11.9% China is only generating 12 million new jobs a year. It needs to generate 24 million new jobs p.a. just to keep unemployment at 25%. So even at this rate unemployment is increasing at the same time as inequality is increasing. (Source Asian Development Bank). In his recent book, The writing on the Wall China and the West in the 21st Century, Will Hutton quotes that China is destroying it’s arable land at the rate of 5% p.a. This seems unbelievable to me and I have not been able to find a source to confirm it. You don’t have to be very good at maths to work out that at this rate of destruction there would be no arable land left in 20 years. And for those people who suggest that technology will come along and solve the problem, I have two questions. What money will we use and who will invest if the environment is unstable? History has shown that innovation only occurs in stable environments. The human race is rapidly losing its resilience. Democracy is an unaffordable system for the whole planet. It has only appeared succesfull because we measure success in the short term and its benefits have been confined to a few. The history of human civilisation could easily be simplified into two parts – pre and post industrial revolution. In almost any chart you look at that has anything to humans over the last 50,000 we inevitably see the same “profile” – the classic hockey stick shape with exponential growth in the last few hundred years. Pre-industrial life has been called a Malthusian trap. Any extra energy that was captured by human’s ended up as extra population rather than as an investment in technology and an increase in average per capita energy usage. I heard the historian Niall Ferguson describe this period as largely a story of subsistence farmers dominated by a few elites. My opinion is that this is an over simplification but the point is that there is an equilibrium between energy harnessed by humans and energy used by humans and this is especially the case in populations that did not posses the technology to store food surpluses. Modern technology has not only given us the capacity to store food surpluses but it has also given us the capacity to increase the “energy yield” for a given area of land. This has allowed us to increase the carrying capacity of the land. But how sustainable is this? What would happen if energy became more expensive? How much of technology is really only a way of “stealing our future” dresses up as “progress”. Take the example of Australia. Before the arrival of white settlers Australia was home to between 700,000 and 900,000 Aborigines. Given that they had been here for at least 50,000 years it is probably safe to assume that this was the equilibrium population level for their level of technology. Compare this to the current population of approximately 23 million where Australia is a net food exporter. But look at bit deeper and you will discover that this has come at a cost. As a result of “modern” farming methods least 25% of the original agricultural land has been turned into desert or has such a high salt content in it that it can’t be used for agriculture. Aquifers have been pumped dry and the water for the major farming area is over allocated. The food production and distribution system is totally dependant on fossil fuels for fertilisers and mechanisation. But fossil fuels are set to run out and will become more expensive before they do. Anyone who looks at these facts and denies that we have “stolen from our future” and destroyed our capital to get where we are is in denial. And what is our response? To look for further economic growth and population increase. This is insanity. One of the by-products of modernity and the notion of constant progress is that Traditional ideas have been discarded for the new. In the Modern world view, reductive science is the measuring stick by which we make sense of the world – we know and we believe because we can measure and experiment. If we can’t measure and verify under controlled conditions we reject. The unintended consequence of making sense of the world this way is that we exclude anything that we can’t objectively measure and quantify – anything subjective is invalid. In the medical world the consequence is that we have a medical system that rejects the role of thoughts and emotions on health because they can’t be measured. Any talk of an energy system that can’t be measured is rejected. The end result is we treat what we can measure and that is the external manifestation of disease – the symptoms. The “hidden” causes of the disease remain untreated. In the economic world the consequence is that we have the free-market system that externalises costs. The present result of this world view is that we have built ourselves an unsustainable economic model. We are destroying our ecological support base and claiming that this model is a success story that the rest of the world should embrace. For example, global commercial fish stocks are projected to be zero by 2050. We are loosing ecosystem services from forests at the rate of $2-$5T p.a. and rising – this is two to three times the size of the projected losses of the current economic meltdown. Who are we to look to for leadership to extricate ourselves from the mess we are in? The leaders of this world – politicians and business people – are locked into a view of the world that rewards them for short term “profits”. The “rules” of the system reward behaviours that deliver short term “benefits” at the cost of the destruction of the asset base that delivers them. Clearly we need a new way to look at the world if we are to come out of this one alive as a species. This means that we have to reconsider our place in the world and how it works. Reductionism has failed as a model. We need models that include the complexity and the interconnectedness of the planet and the whole universe. We need models that place humans in the larger system of Nature, as part of the system and dependant on it for survival. We need models that take into account the long term. Our health and the health of our planet are at stake. My opinion is that the roots of our new human health problems and the health of the planet are connected. We will be unable to heal the planet if we cannot heal ourselves. We need to find a way to live in harmony with our own individual natures as well as with larger Nature. Our major diseases in the western world are now self created “chronic diseases” – the product of living a lifestyle and eating food that our bodies were not evolved to cope with. We are suffering from an intelligence failure. We do not understand our own natures and how we work. As a result we don’t know how to live in harmony with ourselves. In my opinion there are existing models of the universe, the world and life that can help us understand ourselves and the world and live in harmony with it. These are the models of Yoga, Ayurveda, Chinese Medicine and the like. However most of these models have been discarded by modernity because of their antiquity and their lack of scientific validation. Famous scientists like Richard Dawkins have written them off as Mumbo Jumbo. Yet Richard Dawkins is wrong. His blind faith in the validity of scientific research as indisputable truth is not born out by John Ioannisis’s work that has demonstrated that most published research findings are false. As it turns out subjects like evolutionary biology and genetics are changing the way that scientists think. It is no longer a case of Nature vs Nurture. It is now Nature via Nurture. These scientists are rediscovering the principles of Yoga, Ayurveda, Chinese medicine (and even Jyotish) without knowing it. One of my interests is to facilitate the reclamation of ancient wisdom for the good of all species. Every day on the internet I see stories about new discoveries that are really only rediscoveries of the principles of Yoga, Ayurveda and Chinese medicine. Most of the time these stories make no reference to these traditional systems as the source of their inspiration. The result of this failure to connect scientifically validated rediscovery with ancient wisdom is that we take longer to join the dots. My view is that we will eventually rediscover Ayurveda and Chinese Medicine because they are more accurate models of how the world works than reductive science. In modern science speak they are complex adaptive systems models.